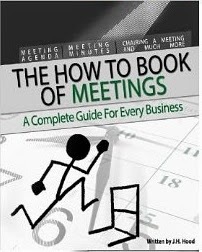 A Girl and Her eBooks: "How to" Book of Meetings by J H Hood - FREEBIE! Have you just been asked to chair a meeting, or take the minutes, or set up a meeting agenda? Need some help? Would samples of an agenda or minutes be useful? What about some techniques for chairing a meeting or dealing with difficult people? Then this “How to ...” book is for you.